New Jersey Gov. Chris Christie blasted Sen. Rand Paul’s (R., Ky.) foreign policy views as "dangerous" on Thursday, making him one of the few high-profile Republican lawmakers to publicly attack Paul’s non-interventionist positions. "As a former prosecutor who was appointed by President George W. Bush on Sept. 10, 2001, I just want us to be really cautious, because this strain of libertarianism that’s going through both parties right now and making big headlines, I think, is a very dangerous thought," Christie said. "You can name any one of them that’s engaged in this," he continued. "I want them to come to New Jersey and sit across from the widows and the orphans and have that conversation. … I’m very nervous about the direction this is moving in." Paul hit back, slamming Christie for allegedly supporting government "overreach." "If Gov. Christie believe the constitutional rights and the privacy of all Americans are ‘esoteric,’ he either needs a new dictionary or he needs to talk to more Americans, because a great number of them are concerned about the dramatic overreach of our government in recent times," Paul senior adviser Doug Stafford said. Paul describes himself as a "realist," and often takes positions associated with non-interventionism. While conservative Republicans on Capitol Hill have privately grumbled about Paul’s foreign policy positions, few have been eager to criticize the popular senator publicly. Many jumped on board with Paul’s 13-hour filibuster in March, when he demanded clarification from the Obama administration on whether it would ever use drones to target U.S. citizens on American soil. Paul is also part of a small but vocal group of Republican lawmakers that has railed against the NSA surveillance program. Sen. John McCain (Ariz.), a leading Republican national security hawk, was criticized after he called Paul and Sen. Ted Cruz (R., Texas) "wacko birds" in March. He later apologized. Some say Paul’s popularity with Tea Party grassroots—he currently leads the field of potential 2016 Republican candidates—makes fellow Republicans wary about speaking out. "There's a fear of confronting Paul because they suspect that he's speaking for the public," said Danielle Pletka, vice-president for foreign and defense policy studies at the American Enterprise Institute. "But what they failed to understand is that the country needs information and leadership. Most Americans, I suspect, aren't really isolationists." Like McCain, Christie received criticism for his comments, which some said were needlessly antagonistic toward libertarians. "The Republican Party badly needs a debate over national security and civil liberties, but that debate will be useful only to the extent it gets beyond generalities," National Review senior editor Ramesh Ponnuru at Bloomberg wrote. "And another thing that Republicans need—at least those who are considering Christie as their presidential standard-bearer in 2016—is to see that the man is capable of a little finesse, especially when it comes to managing the Republican coalition." Others say Christie’s comments tapped into a widespread concern among Republicans. "There is a real concern by many conservatives with Senator Paul's perceived isolationism. A strong and active America is needed not only for those struggling for freedom around the world but also for our own national security," said Republican political consultant Richard Grenell. Grenell added that Paul "has great appeal and is a needed voice on domestic issues." On the Hill, hawks quietly backed Christie’s side of the debate. "Christie represents New Jersey—a state that lost a lot of people on 9/11," said one Republican Senate aide who declined to be named. "When you talk about terrorism in New Jersey, it isn't not the constitutional thought experiment it might be in Kentucky—it's the family down the block who lost their dad in the towers. 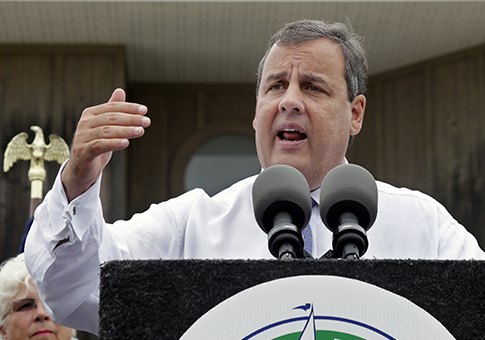 Most Americans, Republican or Democrat, side with Christie on this one." Pletka said she does not expect many Republican leaders to aggressively challenge Paul on his non-interventionist positions for the time being. "As to questions about whether Republicans will get courage from Christie, I fear not," Pletka said. "But I hope so." This entry was posted in Politics and tagged Chris Christie, Congress, Rand Paul. Bookmark the permalink.